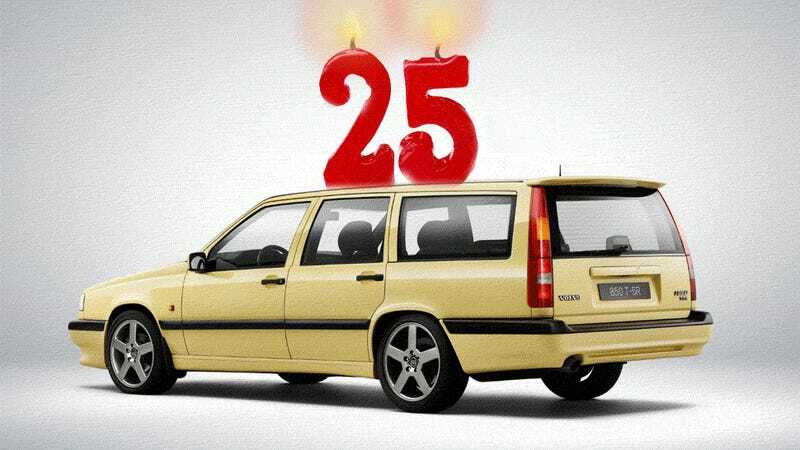 Happy 25th Birthday To The Volvo 850! When you picture the boxy-yet-oddly-sleek Volvo 850, usually a wagon, it’s easy to forget just how radical it was 25 years ago. Volvo was actually quite specific about how radical it was at the time, saying it was, and I quote, “A dynamic car with four world firsts.” So there you go: it was quadra-radical. The transverse five-cylinder engine, the Delta-link rear axle designed in-house, the integrated side-impact protection system, SIPS, and the self-adjusting front seat belt. A transverse inline-five is absolutely bonkers, no question. The side-impact protection system was very important, sure, but that seat belt is pretty boring. Instead of that, I’d rather remind everyone that the 850 was Volvo’s first FWD American-market car (in Europe the DAF-based Volvos brought FWD to the company earlier) and I’d like everyone to picture the 850 wagon’s massive skyscraper-tall taillights. The development of the 850 started in 1978 with a project code-named “Galaxy”—that same project also developed the smaller FWD Volvos, the 440 and 460, in case you were curious. The 850 started with a respectable 170 horsepower on tap, and in 1994 a T-5R model, developed with input from Porsche, was unveiled at the Geneva Motor Show, making a no-joke 240 HP. Volvo made 2500 of these speedy bricks in yellow, then 2500 more in black, and finally 2500 more in dark green. Since they had such a fast wagon now, Volvo got back into racing in 1994 entering the British Touring Car Championship with one of the T-5R wagons. Seeing a boxy Volvo wagon running with those BMWs and Audis and Alfas is nicely entertaining. In 1996, the 850 got all wheel drive, Volvo’s first, and in that way sort of became a proto-crossover, becoming the template for the sort of vehicle that would eventually replace it. In 1997 the 850 was facelifted into the S70 (sedan) and V70 (wagon), and in that guise stuck around until the S and V70 moved to a new platform in 2000. That’s a pretty remarkable run for what was really the last of the old-school, boxy Volvos, and it’s a car absolutely worth taking a moment to wish happy birthday to. Hey, now that the 850 is 25, it can rent a car of its own! I’m sure it must be sick of driving everywhere by itself.